If a picture is worth one thousand words, a political poster with a call to action is worth so much more. The Herbert and Eileen Bernard Museum of Judaica recently announced the extension of its fall exhibit: Justify Your Existence, Graphic Posters from the Moldovan Family Collection through January 29th, 2015. Housed in the iconic Temple Emanu-El Synagogue on Manhattan's Upper East Side, the museum plays home to a priceless permanent collection of Judaica, and yearly rotating temporary exhibits. Past showcases have included early modern broadsides, 20th century Jewish postcards, Jewish cemeteries of Europe, and much more. Now, with its Fall/Winter 2014 exhibit, the museum is focused on a colorful collection of historical posters. Dating back to the early 1900s, each of the 40 posters that comprises this collection is laden with a strong political message. 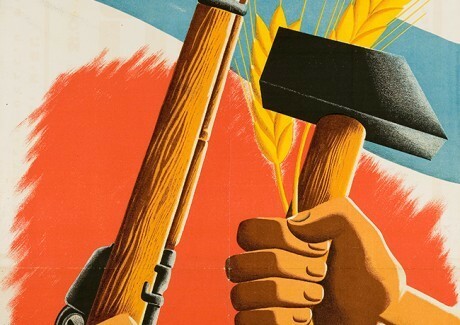 Museum curator Warren Klein shares, "Aside from being graphically strong and appealing, posters are a unique art form which express meaning through the combined use of text and image." He continues, "We are fortunate that the exhibition features many posters that deal with the historical events, political movements, military recruitment and even athletic activities, all connected with the formative years of the founding of the State of Israel." The exhibit is divided into different categories, from relief efforts for Jewish refugees and political action, to Zionism and a call to arms. Each poster features strong wording, poignant imagery, and a resistant political undertone. On loan from the Moldovan family collection, this exhibit reflects the ethos of the late Dr. Alfred Moldovan. Indeed, the title of this exhibit was taken from a passionate quote he has often uttered. "Justify your existence. When you're born in the world, you have an obligation to mankind and this earth, to care for the people, and to improve their lot a little. You have to preserve the earth and appreciate its beauties. If I'm only for myself, what am I? I've spent 70 years of my adult life trying to live up to that demand. I hope I have. I still believe in the innate goodness of man and in the ability of man to be selfless." The Justify Your Existence exhibit stands as a memory, not only to the historical facts that inspired these posters, but as a testament to the lives and strength of those who fought back against injustice, and protected their own. The exhibit will be on display at 1 E. 65th st. New York, NY 10065 through January 29th, 2015. Sunday through Thursday, 10am-4:30pm, admission is free.